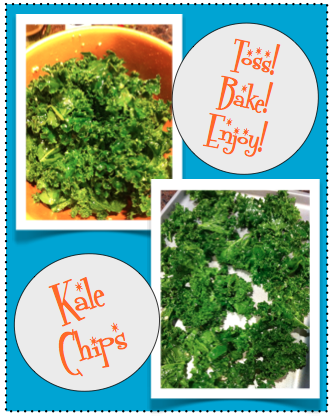 ahorasoyuncronopio: On the Menu: Kale Chips! I know what you're thinking: What-kind-of-chips?!? Yeah, I'm serious. K-A-L-E chips. KALE chips. Kale. Chips. Now. Are we past that? I can't personally take credit for this idea. The recipe is mine, but the idea was passed along from a friend of mine. She told me she had recently made kale chips. I looked at her skeptically (Probably that same look you have as you read this...) But my skepticism went only so far; She usually has some pretty great ideas. She admitted that this idea of kale chips sounds wrong; I agreed. We got past it. Hopefully, you can do the same. I followed her advice and tried making my own version of kale chips. The end result was pretty great. I'm sure you're a bit quizzical about this ingredients list, mainly because it's so weak on quantities. There's a great reason for that; I can't really tell you how much you need. I can say, when it comes to the seasoning, a little goes a long way. However, as far as the specific amounts, you get to completely play with these ingredients and season to taste! I don't know if your grandmother was like mine, but my mamaw seldom really followed a printed recipe. She cooked to taste, and she really had a feel for how much of what was needed here and there. That's kinda how you have prepare this recipe. Cook to taste. Enjoy the freedom. If freedom scares you in cooking, I will share my (approximate) quantities: I grabbed a couple of handfuls of kale, and I used approximately 1/8 tsp of both garlic salt and oregano. I used only a dash of sea salt. Lightly spray cooking sheet with Pam (or other nonstick cooking spray). Set aside. Toss kale in a bowl with olive oil. Spread kale evenly onto cooking sheet. Bake at 350 degrees for 12-15 minutes. The other really great part about this recipe is that it really is completely adaptable to your tastes. I used primarily garlic seasonings because garlic brings out the natural flavor in kale. My friend used garlic as well, but she combined it with paprika and sea salt. I would have used paprika as well, but I just didn't have any in my cabinet. (Running out of paprika? Shameful, I know.) So you can basically do anything you like with these! Have fun! The recipe is simple and adaptable. The end result is tasty and a much healthier option than those processed, bagged potato chips that beckon you in your munchie moments. As a final note, should you have any lingering doubt, even my husband (after laughing at me and my kale "chips") admitted that these were, indeed, good enough to eat. What more proof could you need?! ?